To all you Pinterest life-hackers out there, I am sure you have come across this hack for beating colds and ear infections: administering a few drops of a 3% solution of Hydrogen Peroxide in your ears. The result is most satisfying and dramatic – a bubbling chemical reaction that creates a froth in your ear as a result of the bacteria actually being killed by this powerful solution. It’s fantastic actually, and it can help stop a cold in its tracks when you try it. You feel so much better afterwards and it has also helped our kids when their ears have bothered them too. However, it does not cure middle ear infections, obviously, because it cannot get into the middle ear. But it certainly helps to relieve the infection. This handy solution has been our favorite go-to medication and I swear by it, as well as many others on Pinterest. Like I mentioned, using hydrogen peroxide in the ear canal will not cure a middle ear infection. Which was why I eventually did take my toddler to the Ear, Nose and Throat (ENT) specialist. I decided to cautiously ask the ENT about using hydrogen peroxide in ears for ear infections and colds. With a lot of adamance, he replied, “Never again!”. He explained that we do not know at all if there is a perforation or a hole leading into the middle ear that would allow fluids to enter the middle ear. Sometimes a person may be completely oblivious to the fact. 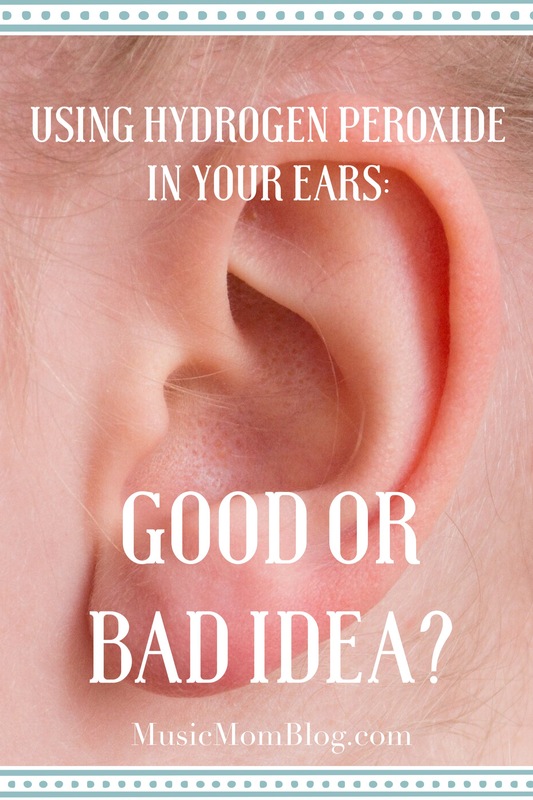 Because hydrogen peroxide is corrosive, it could potentially destroy the nerve-endings present in the middle ear and lead to some degree of deafness. He concluded that hydrogen peroxide should pretty much be left to sterilizing wounds. Okay, you gotta listen to the doc, don’t you? I had previously thought I would be cured of colds for the rest of my life, using this awesome hydrogen peroxide hack. Although, I do value my hearing too much to risk it all for a little cold-cure, but I still feel disappointed that I have not cracked the code of curing colds! If Not Hydrogen Peroxide, What Else? Try making and using a Magic Salt Sock – this is something invented by a chiropractor and somehow it works. She also suggests making an appointment with a chiropractor in order to help re-align the upper neck bones. Misalignments in the upper neck area have been related to ear infections in children. I found a pretty cool hands-on technique that The Motivational Doc shows in a video that you can do to help drain your Eustachian tube, thus helping to relieve the middle-ear a little. The Eustachian tube is pretty much responsible for draining all the gunk from our ears into the nasopharynx (where we can swallow it, great!). The technique looks pretty ridiculous and I was laughing while I tried it, but it helped me to clear the gunk when I tried it! Have a look at the video here. Home-made herbal ear oil with mullein & garlic ear-drops. Herbal ear drops may be mild enough to administer in the ear. But first get a green-light from your doctor or homeopath. An obvious alternative is plain-old pain medication and the prescribed medicated ear drops from your doctor. Some pain medication may lower fever which may or may not be a good idea. A fever is the body’s way of fighting the infection, however, if the fever is too high, it may need to be brought down. Again, ask your doctor! Antibiotics may be necessary if the situation has gotten really bad. Antibiotics are not ideal, and should be a last resort, but they have their time and place in our health. If pain and infection persists, you need to go see an ENT. If left too long untreated, it may result in long-term middle-ear damage, plus hampering speech development in young children. Why are there so many people then, who, like I used to, swear by using hydrogen peroxide in your ears when it is potentially quite harmful? It boils down to the principle that advice-givers and advice-takers should verify facts from expert sources before giving or taking advice. Hey, you should even verify what I am telling you in this article! What we can learn is that we all have a responsibility to exercise caution with the self-treatment ideas we get on the Internet. Scrutinize the logic, learn the facts and science behind things, and ask the experts. What if I had a perforation in my middle ear unbeknown to me? Which, by the way, is a possibility and it is not always painful. I could have suffered with damage to my hearing for the rest of my life! No way! Perhaps you should also ask your doctor or ENT for their thoughts on using hydrogen peroxide. Or, if you have any wonderful ways to banish ear-aches and infections, feel free to comment below! You may also want to check out my other post, What To Do When You Are Sick (But Still Trying to Function), it has some great tips for trying to recover while keeping your life going, plus a free cute Whatsapp profile picture you can use to let people know when you are unwell. For all of you who are struggling with ear infections – you or your little ones – Good Luck!